So if you have followed my blog from the very start - you will know I am a big 'Collective Dairy' fan! I can't even describe how good their yoghurts are - the best thing to tell you is - to go buy one and try it. I previously did a post on their 'Passionfruit' yoghurt which you can find HERE. So recently they brought out a new Limited Edition yoghurt - a coffee flavoured one. So after checking about 10 different supermarkets I eventually found it - as it was either out of stock or the store didn't stock it! So Sainsbury's had it and they had the 2 for £4 deal on so I ended up buying the 'Limited Edition Coffee' and the 'Scottish Raspberry' - which is cool you know - what with me being Scottish! So first of all - in terms of looks the coffee yoghurt has some artistic work on the lid - which looks great. Whenever I make coffee at work I always try and make foam and designs and it never works. 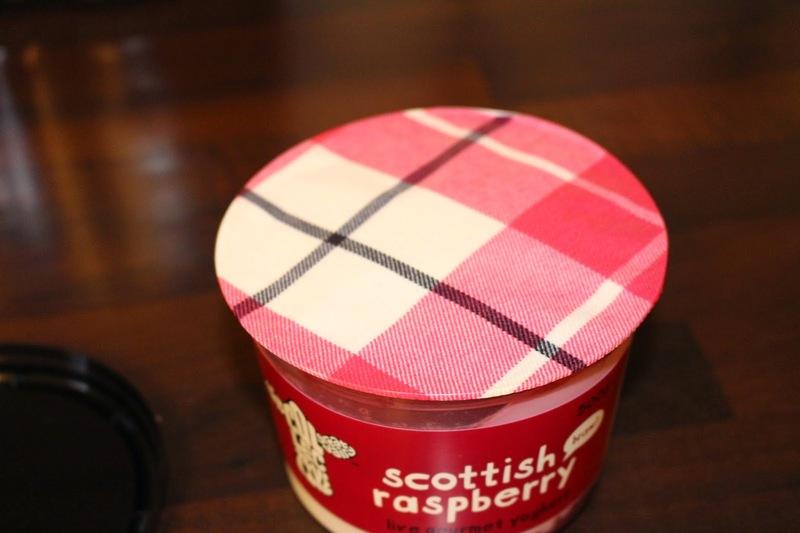 The raspberry yoghurt - has gotten the lid down to a tee. Obviously with it being Scottish and all - tartan was the way to go :) I actually really like this tartan design. It's like an off-pink chalk colour. The coffee yoghurt used 100% arabica beans from Columbia - if you are a coffee drinker then you may have tried Columbian coffee (as I work in a Starbucks admin office) I know all about it (not saying I'm an expert). This is very similar but its in a yoghurt! It's a great taste and its not too nippy - as I always notice with coffee that it can leave a harsh taste in your mouth - this yoghurt didn't do that - which is a plus with me as I always like to sweeten my coffee with caramel to take that edge off. The raspberry yoghurt was absolutely amazing and I actually went and had seconds. It's really sweet and the ratio of raspberry to yoghurt is just right. The only thing that put me off (not the yoghurts fault) is that raspberry seeds and me do not get on as they get stuck in my teeth - apart from that I really enjoyed the yoghurt. I like to mix things up for breakfast and try new things - so I chopped up some banana and added a dollop of the yoghurts on the side for my breakfasts on Saturday and Sunday! Hope you guys enjoyed the post!! Let me know in the comments below if you have tried any.